I wasn’t someone who fantasised about upping sticks and starting a new life somewhere else. Far from it in fact: there were dozens of things I wanted to change, but London wasn’t one of them. It suited me, I fit I’d think as I pounded its pavements, parks and up the left hand side of the escalator in Camden Town station, as I worshipped in its temples of art, books, music, theatre and beer. I grumbled of course, but then I grumble everywhere, only never for very long. There were bouts of wanderlust too. Nothing serious though and nothing that couldn’t be remedied by a nice, long holiday. From which I was always glad to get back, my faith and fancy for London renewed. Then I upped sticks and started a new life in Rome. A long-short story I’ve told before and will probably tell again – more concisely – another time. Why I mention this today, is not to unravel anything, but because yesterday morning as I walked back home down Via Galvani, the market to my left, a two thousand-year old mound of broken terracotta pots to my right, bags cutting into the crook of my arm, the September sun searing my unmediterranean skin, unable to find the words in Italian to reprimand the man parking his car across the zebra crossing, I realised that Rome suits me, I fit. Which is surprising considering my reluctance at the start, the fact that Rome has made me acutely aware of other, outside and feel more English – which I can only describe as feeling straight only wonky – than I ever did in England, that I have struggled so inelegantly with language, culture and pasta cooking water. Or maybe it isn’t surprising, after all, there is love and work. Love of Rome itself, glorious and grimy, particularly my wedge-shaped quarter Testaccio and the people in it. Of Roman food: bold, brash, genuine, simple, redolent of herbs, pulses, grains, pork, lamb, ricotta, olive oil, vegetables. A love for Luca – which I would have anywhere I know – that feels inextricably knotted with the city he was born in. Yesterday he swaggered along beside me, maritozzo (a sweet yeasted bun) in hand and cream on his face, looking as Roman as his papà, treading the pavement as if he owned it, which in a way he does. He is two this week. I am 41 next week, a number which seems to fit me too, in a comfortable, slightly crumpled way. Then there is work, work I really like, as an English and theatre teacher, singing children’s books to life with my Brazilian guitar playing sidekick for a captive audience of five years olds. ‘Don’t get your knickers in a twist said Jack, let’s have a look in the patchwork sack? My former actress self would have shuddered, which says it all really, she was always getting her knickers in a twist. And now there is work that is muddled with love: writing a book with a British publishing house called Saltyard Books and a US one called Grand Central Publishing, a project so good and fitting it makes me want to open a bottle of wine, drink it all, dance on a table and then fall off. I have a nearly year to write the book, which is called Five Quarters, Recipes from a Roman kitchen. First and foremost it will be a recipe book, a distinctly Roman one, but one in which the recipes are woven together by stories, seasons, daily life, people, pictures and other pieces. In short it will be rather like my blog, only neater, with more rhyme and reason and edited by those who know how to use semicolons correctly and recognise when 800 words should be 400. I plan to talk about the book here, not too much, but enough to make sense of what is happening in my life and more importantly in my kitchen. Keeping notes about the book here is also a way to include you all, after all you are as much a part of this book as the market, my butcher, my baker or my family. It is thanks to you all reading and cooking along that I am where I am now. I feel full of appreciation, thank you. And so the recipe, panzanella, or bread salad, a Tuscan dish, but one also found on Roman tables, a dish it had taken me a while to understand. Which is slightly ridiculous considering how simple it is to make. My panzanella hesitation arose from my reluctance to acknowledge that panzanella is made from old bread dampened back to life with water. It was the dampening you see, the idea of wetting bread until soft and soggy then squeezing, it just seemed odd. As so often the case I needed to watch someone else, something I am doing rather a lot these days. When I arrived at Jo’s house there were three or four hunks of old bread (excellent quality coarse country bread) sitting in a bowl of water, wallowing really. Once they were soft and soaked, she ripped the bread into rough pieces and then got me to squeeze away the excess water and then break the bread into soft crumbs in a large bowl. Traditionally panzanella was little more than dampened bread, salt, oil, vinegar and fantasy, a dish born out of necessity and resourcefulness, something Romans were (and to a certain extent still are) very good at. If they were available, chopped tomatoes and their juices, ripped basil, cucumber, onion, olives or anchovy might be added to the unchanging foundation of damp bread, olive oil, salt and a sharpening douse of vinegar. Like Jo, I added chopped tomatoes, cucumber, mild red onion and lots of ripped basil. I was generous with the olive oil and careful with the red wine vinegar (just enough to sharpen, not too much as to shock, which is obviously a matter of taste.) I let the panzanella sit for an hour before serving, so the crumbs could soak up the flavours and then settle down again. If like me you are used to rather more modern interpretations of panzanella, of bowls of toasted cubes, of garlic rubbed chunks, of pretty things with peaches, soft greens, and heirloom tomatoes, this might come as a bit of a surprise, being is it is a soft, sodden tumble, a damp salad more reminiscent of cous cous than bread, even though it is unmistakably bread. However panzanella made this way makes more sense, it is also good, tasty, full and fitting for these last days of summer. Bread, love, fantasy, work, and lunch, what more could I want. A drink of course, make mine a prosecco. serves 4 as lunch (with a chop or two) or six as part of an antipasti. 6 thick slices of old (good quality) country bread. Sourdough works. Put the slices of bread in a bowl, sprinkle generously with cold water and leave for 20 minutes. Wash and small dice the tomatoes making sure to catch any juices. Peel and finely slice the red onion. Peel and dice the cucumber (cutting away the central seeds of you feel they are bitter.) Rip the basil leaves into small spices. 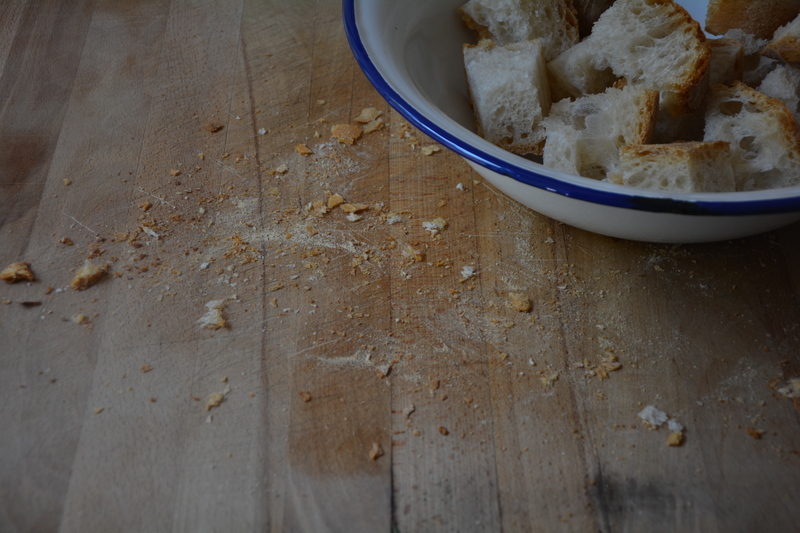 Using your hands tear and crumble the damp bread into rough crumbs and rags, squeezing it over the sink if it feel too damp. Put the bread back in the bowl. Add the chopped vegetables (and juices) to the bread. Sprinkle generously with salt, douse with olive oil and sprinkle with a little red wine vinegar. Use your hands to mix and turn the salad. Allow to sit for 30 minutes. Mix again and serve. Good bread is fundamental, coarse country bread or sourdough works well, bad bread will collapse into a gluey mess. It should be at least two days old, so firm, hard even. The way you wet the bread depends on how hard it is! Day old bread might only need a sprinkle – Vincenzo’s Nonna waved the slices under the tap, back and forth. Some people pour an inch of water into the bowl and then lay the slices in the water, like my child in a puddle. Really hard bread, might need a proper bath-like soak and then a blooming good squeeze, after all the salad should be damp but not wet. It is up to you if you rip the bread into rags or break it into crumbs. If you find the flavour of raw red onion too strong, soak the slices in a half water/half vinegar solution for 20 minutes before adding them to the salad, this will take away the onion punch but leave the savory- sweetness. Another note – I apologise if you are seeing an advert here, I had no idea, it is very annoying but the price you pay for an otherwise brilliant wordpress blog. I am getting them removed. so glad about the writing rachel- as i do look forward to your blogs- keep right on……C. Thank you and I will blog and book both. I have known as I read this blog week after week that a book contract was awaiting. So pleased to hear it! Firstly – so excited about Five Quarters, can’t wait to devour it, I’m sure it will be wonderful! 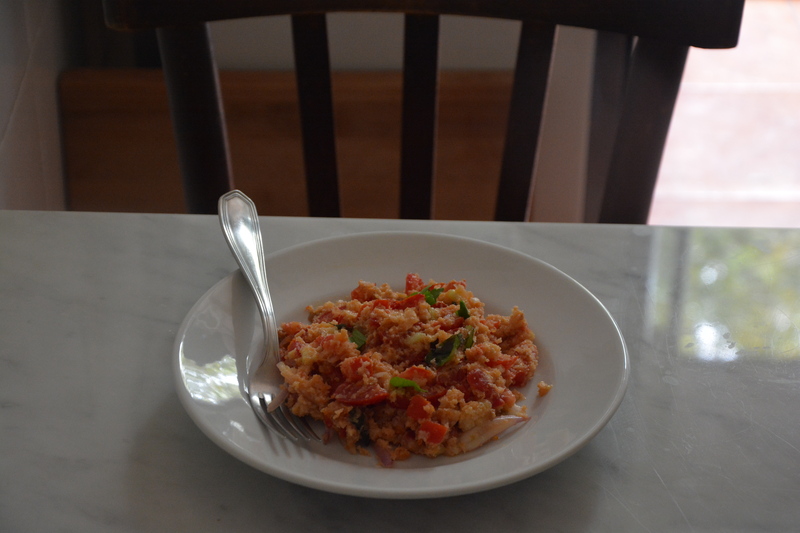 Secondly – panzanella, obligatory Tuscan summer dish, I love it. The soaking the bread thing is really what makes this dish and can be tricky if working with the wrong bread (something I find here, trying to replicate it, I’m convinced that only Tuscan bread seems to have the right consistency, it retains it’s form and spring and doesn’t turn to mush). I have a tendency to sprinkle rather than soak with water and then let the juices from the tomatoes, the oil, the vinegar do the rest. Lastly, auguroni to Luca! Having followed your blog for ages, I’m delighted that a book is in the offing. You deserve to be in print! I’m always glad to see another post from you, love the atmosphere you create and the excellent photos sprinkled throughout like tasty tidbits. Thank you so much Judy and i am so glad you enjoy the blog. About time too on the book front! And very well done – I shall look forward to it. And as for Jack and the Flumflum Tree – one of my very favourites – I read it ostensibly for the grandchildren but really…….. I can’t tell you how many times I’ve come over here and left saying someone needs to give that girl a cookbook deal. What excellent news! Congratulations! I already can’t wait. Now of course I just need to write it, which is exciting and terrifying. thank you for all your cheering and support, it means much. There is, I just hope the book is beautiful and inspiring. I have never had a Levantine fattoush salad but now I must. Hooray! At last, the news I have been waiting for, for as long as I have read your blog. I am looking forward to the book very much. Happy birthday gorgeous Luca. 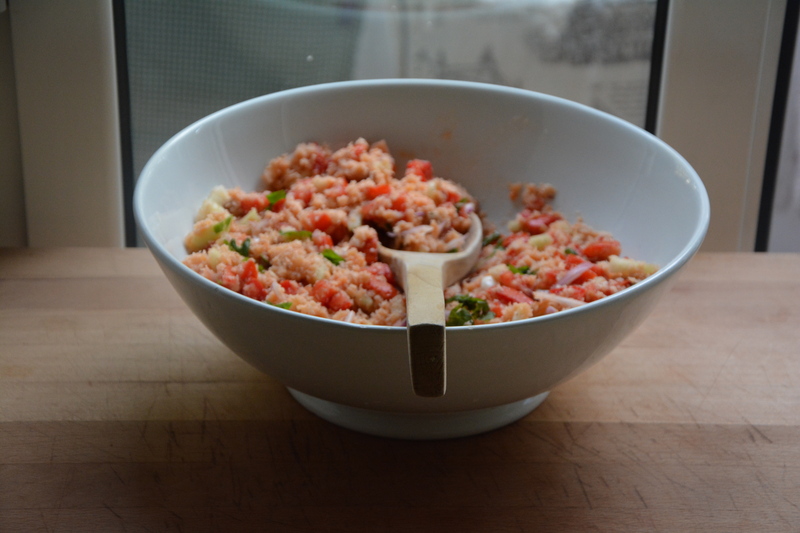 I made panzanella the other week and we enjoyed it very much. Congratulations on the book deal – what fantastic news! Looking forward to reading the book already! Auguri to Luca as well. Thank you Sophia. Luca may only be two but he has grasped the concept of presents and keeps shouting ‘present Luca’ very loudly. Love each and every one of your posts – read from Brighton. They never fail to make my day a whole lot nicer! Also really looking forward to your book – what a treat! Lovely Brighton (I have spent many happy days there.) So glad to make days nicer. It’s September 11th, always a somber day in NYC, so I especially welcome the good news about Five Quarters. I think most of your story is still to be revealed! This is a deal you truly deserve; I hope they will allow you to do the reading for the Audible version yourself. I keep an Imperial measuring cup and an oven conversion chart in my kitchen to use with my English cookbooks. My young cousin is off to live in England, and I sent her packing just two days ago with US cup measures, liquid and dry, and a copy of Fanny Farmer. But awaiting her at the other end was a package from me with Delia’s How to Cook, Nigella’s How to Eat, and Guiliano’s The Classic Pasta Cookbook. As soon as your book comes out, I will send her a copy – UK version, of course. Last September you gave us Luisa’s Pappa al Pomodoro, the exact version I make in the late summer and dream about all the rest of the year. Now this. My two day-old bread from Sullivan Street Bakery is about to be put to good use. I can’t wait for your book! I’m sure it will be a special read filled with lots of good food and beautiful pics. I am fascinated by this salad. I’m the traditional big chunks of dry bread punctuating my salad. But, everything you do in the kitchen is magic so I’m bound to give it a try. Thank you and have a lovely 41st Bday next week! Congrats! Looking so much forward to your book. Your blog is an ongoing source of inspiration. Thanks. I have been reading your blog for ages and, sorry, never managed to leave a comment. But i just had to say congrats on your book deal. I work for a publishing house in the UK and I wanted us so to do your book, but I am in sales and not editorial and all I can do is suggest. Now i can say ‘I told you so’. Saltyard Books is a great place to do your book. Can’t wait to read it! Rachel – I am thrilled for you on the book deals. But it is also good news for me as well – a beautiful book in additon to these blogs which are always a delight to have pop up. Here’s a big hug and smile of congratulations. Good luck with this fantastic adventure, my friend. 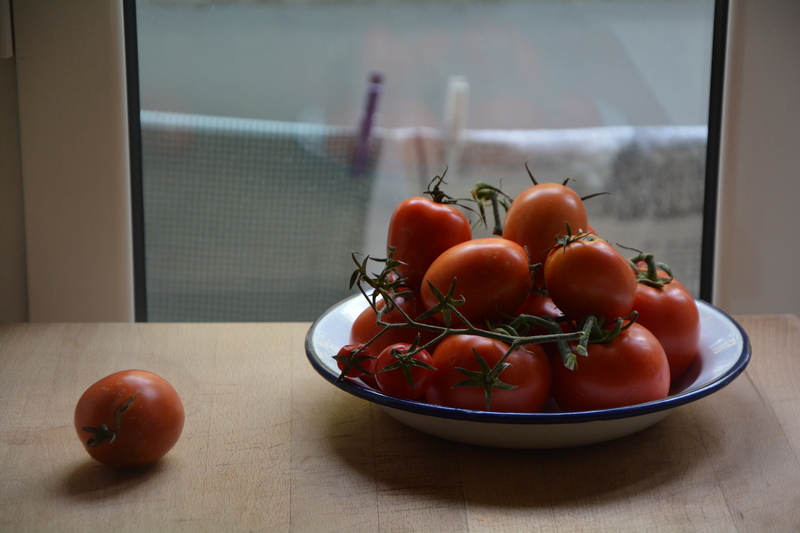 It’s been ages since my last comment since I’ve really quit blogging, but I’ve remained a silent reader, sneaking looks at those gorgeous, overripe tomatoes in your photos whenever possible. I just want to say congratulations! I’ve long thought you should write a book because everything here is so wonderful. I’m going to be honest and say that books by bloggers have tended to disappoint me but I’d buy yours in a minute. On a more shallow note, I’d like to say how stunning you look in your profile pic and that every time you change the photo, you look even better which is rather annoying 😉 Your life in Italy has even inspired me to start learning the language again in anticipation of my next trip to Venice, whenever that might be. Take care and congrats again! So, so pleased for you Rachel! Meanwhile, as ever, beautiful post. Wish I could lift a glass of with you Prosecco today. Oh wow, oh wow! Best news ever! So very delighted to read this. I cannot wait for your book; I know it will be marvelous. Best of luck to you and enjoy the process! Thank you Nicole, it is, even though today i am feeling a little overwhelmed by procrastination, but yes I will enjoy it, after all it is food and writing, what could be better. I love your blog! thank you so much for your lovely recipes. Will buy the book when released!!! Love, love, love this: the book, Panzanella (which I’ve been making with broken-up Friselle di Altamura as I don’t seem to buy bread anymore) and you & Luca. And, you know what? Your words taste sooooo good. Congratulations on the book(s)! I have been hoping that you’d write one, so I’m selfishly happy about it. It will be in my kitchen as soon as it’s available. And once again, you have gotten inside my brain and walked me through a recipe I’ve been thinking but feeling funny about this month. Thank you as always! Thank you, I have been hoping too. It took a while to come together but then it did. the publishing houses are just great, I hope it will be a book to enjoy and use again and again. A book! Finalmente! Looking forward to it– good luck! 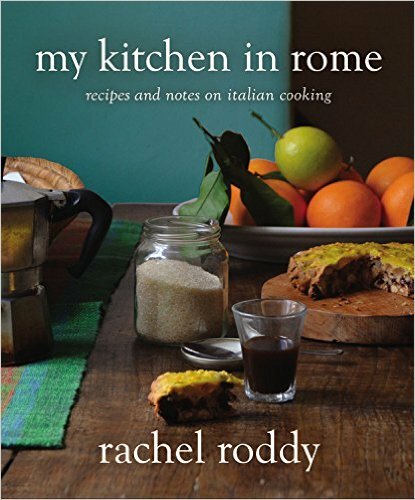 Dear Rachel, Auguri on the new cookbook! Finding your blog has been such a joy for me and I await every one of your posts with anticipation. I am so very happy for you and excited to cook from your book. Bravissima! I hope you one day meet you in person on my next trip to Rome so I can congratulate you in person. Shake, shake, shake the first four ingredients in a cocktail shaker filled with ice until very cold. Serve in a martini glass garnished with a cherry. Rachel! I’m so excited that you’re writing a cookbook! But more than just a cookbook, a book, which you’re deserving of, because every time I click on your blog, I stop everything else to read, and absorb each and every word, like the stale bread in panzarella does soaking up the water and olive oil and tomato juices. I’m already going to order your book, supposing they ship to where I am in Argentina (or some other part of the world, hopefully la bella Italia!) Baci. Ciao, Rachel. So many things to say today! CONGRATULATIONS on the book you’ll be sweating over this coming year; we’ve all been waiting eagerly for this particular piece of news and will wait for the book itself with bated breath. Never been a Lollo fan but love your “pane, amore e fantasia”! Buon Compleanno this week to Luca and next week to you. All hail to untwisted knickers! It’s easier to get appropriate stale bread (for panzanella, ribollita, pappa al pomodoro, etc.) up here because Tuscan bread is unsalted (to go with the salted Tuscan prosciutto). You gave lovely instructions in re the infinite number of variations on the soaking-the-bread theme! From the photo, your panzanella looks divine. Last but not least, apologies for the anachronistic tweet yesterday. It was late at night and although certain references struck me as a bit out of sync, it was mostly my head that was foggy. Oh Rachel, congratulations on your book! I cant wait! This panzanella makes so much sense. I order them occasionally, at restaurants, when tomatoes are in season, and I have this idea of how they should be: sharp, sweet, flavorfull, tomatoey, salty, oily… and they’re always bland and disappointing. I will try your method. Panzanella is such a good idea, it must be possible to do it well! Thank you Kate, and yes it does, just remember the bead should be good quality and two days old. 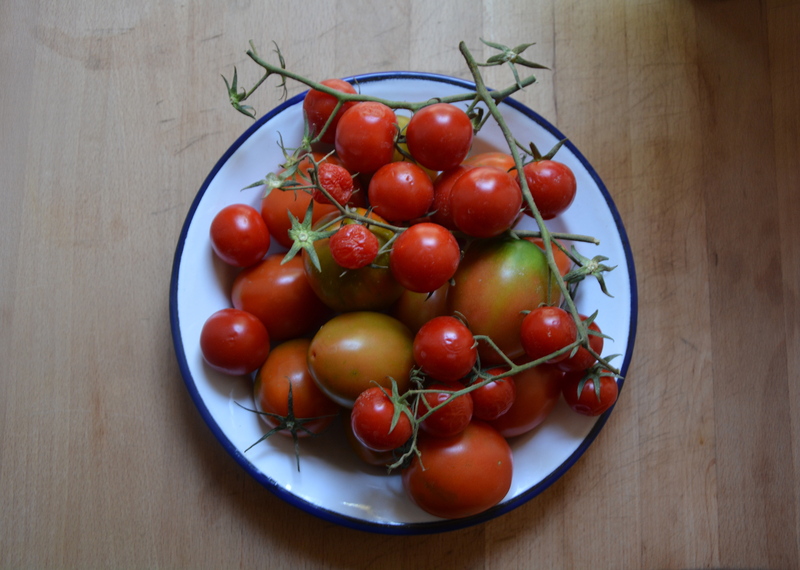 Sharp, sweet, flavorfull, tomatoey, salty, oily….yes all those things. Complimenti!! Great news about your publishing opportunities. Very excited for you. CONGRATULATIONS!!! I have been waiting ages for this news. So happy for you (and for myself, as your reader)!! Thank you so much, I have been waiting too and then waiting to tell you all while contracts and agreements were hatched. Now I just need to write it. wow – congrats, Rachel! that is great news! It is and thank you v much. Marvelous news about the book! Congratulations! I really look forward to reading about the process (and to the book, naturally). Earlier this year, I was mortified to find the most ghastly adverts of the “lose 10kg with [preposterous method]” type at the bottom of my WordPress blog. They’re a little sneaky about it – you’re unaware that they’re there unless you’re not logged in, and you don’t really opt in (as you would with blogger) and there’s only a vague mention in the T&Cs. Ditched them immediately of course. Thank you Carol. And yes, yikes about the adverts, I had no idea and only found out when I was logged out. They should be gone by tomorrow. Congratulations my dear, and happy birthday! Terrific news! Congratulations. I have thoroughly enjoyed your way with words, phrases and story telling – I look very much forward to reading the book. I have no doubt that it would be fantastic. Good luck! Also, thank you for writing. I love the bits of Rome and richness of dishes you bring to my life from yours. Thanks Jim, I hope hope it is too, at least we can be certain about Rome and the recipes being fantastic. Hurrah! Your book will be marvelous, I am sure, just like your blog. I’m so glad to hear you’re writing one. Best wishes as you begin the process! Rachel, SO VERY HAPPY to hear about your book deal!!! Every time I read your blog, i think, wow….she is amazing, she needs to write a book…. Congrats, enjoy the process and I’ll be waiting for it! Ah thanks Susan, and I think how lucky I am to have such nice readers. Love panzanella! Congratulations about the book. You’re a wonderful evocative writer. I hope your editors will be wise enough not to over intervene. Yay, finally official! So so happy, can’t wait to have it in my hands and rave and dream about your kitchen and Testaccio and Rome. Panzanella – I get a bit angry when I see dishes with croutons being called panzanella 🙂 I know I an nutters. It is just because I think this one, like you did, is so perfect and so good it should be the one and only. That is brilliant news! I have been wondering if and when you would be writing a book as you write about food and life so beautifully! Thank you so much Sakura, it took a while for everything to come together but then it did. Now I just need finish it. Thank you too for your loyal readership – I am very lucky. ah, congratulations. I suppose it was only a matter of time, wasn’t it? as much as I love blogs and the forum they provide, getting to buy and keep and reflect on books from my favorites is the best. Looking forward to it. oh my goodness – congratulations! love your writing and looking forward to seeing it in print. if your blog is any indication the book’s going to be fab. Happy Birthday to you and Lucca I hope you both have wonderful birth days and congrats on your book, if it are anything like your blog it will be a best seller in no time. Thanks Carolle, In intend to drink and dance on a table while luca eats gelato and dances under one. your recipes are authentic and I love your stories! Baking with a madre is not as difficult as people think, it just requires patience. I feel exactly the same way about London – it felt like home from the moment I arrived. I love Boston, and I feel very ‘at home’ here, but it doesn’t feel like ‘home’ in the same way, if that makes any sense?! Yes it makes perfect sense. Thanks Sarah, v much. I have a new recipe for gnocchi (yes, I know I am forever changing and saying this is the way and then no no, this is the way). I will post it once the weather gets a bit cooler and gnocchi-like. Excellent, in that case I will wait to try my gnocchi experiment! A friend made beautiful gnocchi the other day, which reminded me it’s still something I want to try. I did finally make your artichoke lasagne a few months back, which was a revelation. I confess to using tinned artichokes, but I think it was my best pasta yet, and I loved how it turned out with lots of layers of pasta. Hooray for making lasagna, gnocchi too, I will post in early october. rachel! this is all so exciting, the book, the panzanella, luca and his maritozzo, the upcoming birthday. also, there are no ads from here. I had them at one point and installed adblock on firefox. it’s some kind of ad bug, if you try viewing your blog from another browser you won’t see them! Great news about the book! I’ll look forward to it — and to helping to sell it at the bookstore I work in. I would like to preorder your book now. 🙂 I’m very fond of the “modern” panzanella, and so I must push myself to try this authentic recipe. I love a good surprise! that certainly looks yummy… good luck and have fun writing the book. I will be following along and getting inspired – the photos made me hungry. bon appetit! Thanks Clay, I like being reminded to have fun – it is the key I think. Bravo! Both publishers are lucky to have you on board. Looking forward to it, Rachel. Looking forward to your book. Congrats!! 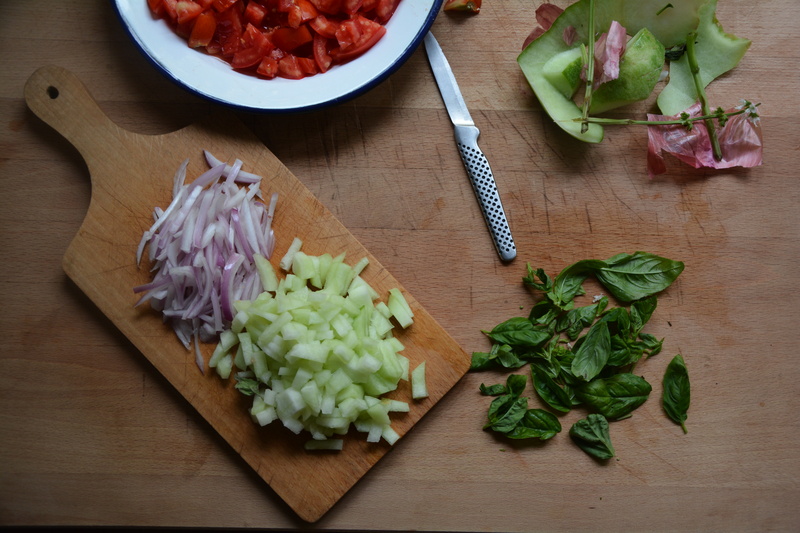 Thank you Rachel, for this… Panzanella is simple, with the simplicity and deliciousness of poor’s people food, in this case with the available wanders of Tuscany. Yet, in the case of Tuscany, my theory is that they had to come up with many dishes to use stale bread, because they have tons of it. Why they keep on making bread without salt only they know (if so), but the fact is that they have more stale bread than anywhere in Italy, and many more stale bread dishes (pappa al pomodoro, ecc). I have to say I like Tuscan bread (without salt) with salty things, especially anchovies, butter and malden salt (I am after all an English barbarian) I think you are right, my panzanella would have been even better made with it. Congratulations on the book deal. Do you know that there is already a book by Anissa Helou, called Offal: the fifth quarter? I hope there isn’t too much confusion. I haven’t corresponded anything like as much as I’d like. I don’t write with alacrity (and have so very little time) so i haven’t given back yet, so to speak. Given that you introduce more beauty into my life than I have a right to for free, it seems only fair that you should make a living from it. I am glad. Happy for you and the promise of good work getting it’s just reward! What do the Roman’s do jam-wise? It’s getting about that time! Do you mean what do they make jam wise? Fig, plum and peach at this time of year. 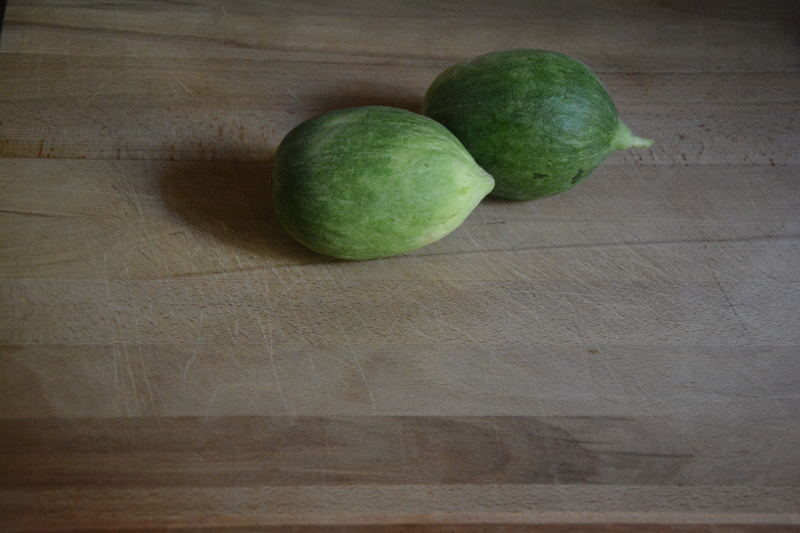 I am planning some fig this weekend if I can get myself into gear. I am a friend of Nancy’s and I am doing the food styling for her upcoming book celebrating Third Thursday Potluck dinners over the past few years. I follow your blog regularly. She has told me a bit about you and so I want to congratulate you as well on your book. It seems books are popping up everywhere I turn…good for you, good for Nancy and good for me for knowing about folks like you two. 🙂 I love the salt bomb addition: anchovies! (i am glad i do not have a heart condition). My comment was not addressed at your panzanella! I am sure it is superb, as superb as it can be. Hello Mara – I agree on an anchovy salt bomb whenever possible. Have a look at the teatro verde website, we have several classes this year and would love to meet you. Thanks Rachel! I looked at the schedule of plays but not classes… But I will soon (after ‘inserimento’ is inserito). It would be a pleasure! I just realized, as I was reading your new post, that I did not congratulate you for your book when I read this (maybe I was reading it from my desk at the office and quickly had to leave…?). In any case, congratulations! I am so happy for you, it is totally deserved. Fabulous news about the book! I’m very much looking forward to reading it. Your writing brings me so much pleasure. Thank you. Thank you so much, I am truly fortunate to have such a lovely group of readers and cooks. so excited to hear about your book, it was only a month or two ago i was asking when a book would happen! very much looking forward to reading it, though you don’t seem the type to rush things – please write it quickly!